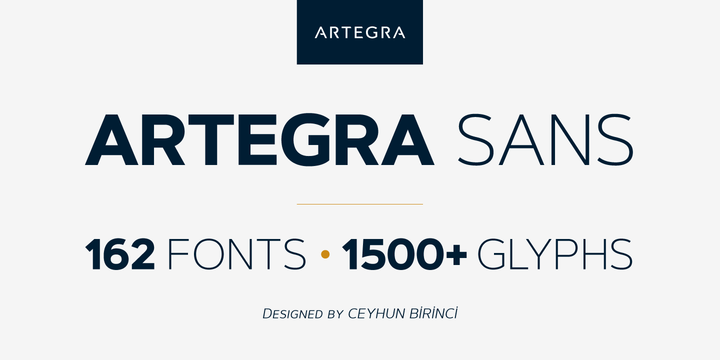 Artegra Sans is a gigantic family typeface created by Ceyhun Birinci and published by Artegra which was designed during 4 years. The project started as a comprehensive typeface families, it pay attention to details and it offers quality. It comes in 3 widths (Condensed, Normal, Extended) each with 9 weights (from Thin to Black) with accompanying italics. A family font of 162 fonts with over 1500 glyphs per font, a wide range of OpenType features and multilingual support. It can by use for any kind of project, from branding, magazine, display, text to web, mobile application design and so on. Price: starting from $25 for one font to $575 for all 162 fonts. A font description published on Friday, March 17th, 2017 in Artegra, Ceyhun Birinci, Fonts by Alexandra that has 5,118 views.